Today, the TomBobBlender Show is streaming a live Mega Man 1-9 playthrough with intentions of raising money for the Red Cross Haiti Relief. Donations will go towards supplying food, shelter and support for the victims of the Haiti earthquake. As of this writing, the show has managed to raise $285 of their $2,010 goal. You can find the stream below, and you can send donations via the group's PayPal account here. It's all for a good and worthy cause! WHOMP WILY! (Bronze Trophy) – Clear the game once. SUPERHERO (Bronze Trophy) – Clear the game on HARD. WORLD WARRIOR (Bronze Trophy) – Defeat one of every type of enemy. TRUSTY SIDEARM (Bronze Trophy) – Defeat the 8 bosses with just your default weapon. NO COFFEE BREAK (Bronze Trophy)– Clear the game without using any energy, mystery or weapon tanks. BLUE BOMBER (Silver Trophy) – Clear the game in under an hour. HARD ROCK (Silver Trophy) – Make it to a boss room without getting damaged. HEADBANGING (Silver Trophy) – Defeat the 8 bosses without your helmet on. DESTROYER (Silver Trophy) – Defeat 1000 enemies. TENACIOUS (Silver Trophy)– Clear the game without continuing. INVINCIBLE (Silver Trophy) – Clear the game without dying. MR. PERFECT (Silver Trophy) – Clear the game without getting damaged. Inafune's back with another batch of answers to your questions. Topics this time around include Powered Up 2, Mega Man animation, fan works, the franchise's future, and a whole lot more. Check them out after the break! Capcom apologizes for the inconvenience and will update the game's official site with a new release date as soon as a decision is made. No word if the delay will affect the English version (June 2010), but depressing news nonetheless. I'll keep you informed. 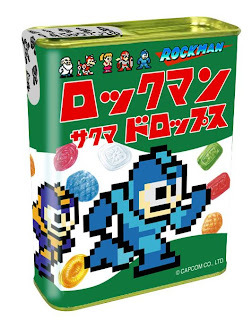 The "Rockman Sakuma Drops" come in eight variates of flavor: melon, mint, orange, plum, pine, strawberry, lemon and apple -- the colors of which supposedly correspond with Rock's special weapons featured in RM10. Oh, and best of all, the candy is said to help you "prepare for the Roboenza outbreak." Cute. The product is scheduled to release March 6 for 350 Yen, or roughly $3.92 USD. Naturally, it's a limited time only deal, so this is likely to become a collector's item. 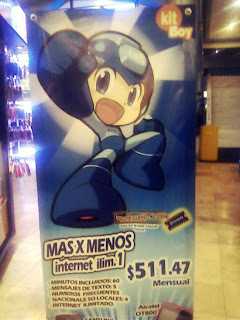 European Mega Man fans, rejoice. Hot on the heels of Nintendo Europe's Media Summit, Capcom revealed the release dates for Mega Man 10, and it's coming soon. Real soon. The Wii version is first out the door, releasing on March 5. A week later, the PS3 version releases on March 11, followed by a March 31 release for the Xbox 360 version. Pretty much the same release dates as North America, but the European Wii version hits a few days later than the US (March 1). Oh so awesome. How often do we see a Sniper Joe figure? Let alone Tornado Man?! 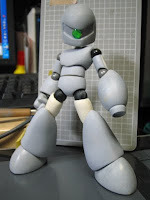 Joe is said to be 12cm in scale, and when colored, will resemble the Mega Man 7 variation. Accessories like his trademark shield and swappable red/green mono eye are said to be included with the kit. Tornado Man on the other hand has no accessories for the time being. I'll be sure to post up the fully painted models once the sculptor makes them available. Nevertheless, these are looking mighty fine for work-in-progress stages! Hit the jump for a portion of questions/answers! For the rest, you'll have to make your way over to Capcom-Unity. In honor of Mega Man 10's release, Capcom Japan is producing a new variation of the popular E-Tank energy drink, which features Rockman 10 branding and a new blueberry flavor. Side-by-side comparison of new/old design below after the break. "As most folks know, I'm a huge PC gamer and advocate of PC gaming in general. That said, even I will admit, there probably isn't a sizable enough audience for EVERY game on every platform. I'm struggling to see a large enough audience for MM9/10 on PC that doesn't also own one of the consoles that content is available for. That said, you never know when someone will get a desire to make it." Personally, I believe there is a certain group who would appreciate MM10 and MM9 PC ports, like those who don't own current-gen home consoles and get their game on strictly through the PC -- but, as Mr. Svensson noted, is that a big enough audience? What's your stance on the issue? The iPhone and iPod Touch version of Mega Man 2 is on sale once again. The game was recently marked down by 80% the other day, on sale for a low $0.99. No indication when the offer expires, so you might want to get on this deal before it's gone. You can purchase the game, and its subsequent demo version (for free) directly off of the iTunes Store. Thanks for the pointer, Vasili. Wow, can you believe it? After many years of petitioning and demanding, Hitoshi Ariga's acclaimed Mega Man Megamix manga is finally coming stateside, and soon, too! Our pal at UDON, Matt Moylan, sends word that volume 1 will be hitting comic book stores Wednesday, February 24th. Other book stores, and online retailers like Amazon should be shipping the book some time around then, too. 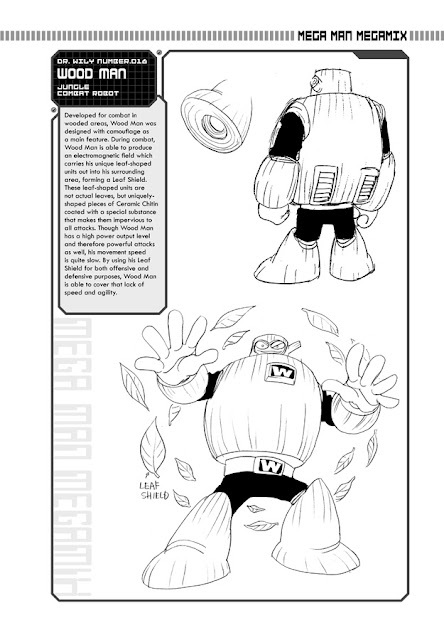 To celebrate Megamix's release, Matt let loose a sneak peak at the final product (right), and another preview page from the book's Robot Master profile section. Which Robot Master is spotlighted this time? Find out after the break! You remember the wave 2 Rotos, don't you? 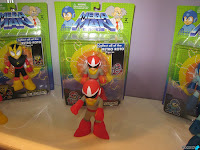 After the initial Retro Roto line, Jazwares planned on producing Rotos based off of Heat Man, Wood Man and Ice Man -- sadly, they were never released publicly, but hey, that might soon change! Is Tango In Mega Man 10? "A few days ago IGN posted some new videos and screens of Mega Man 10. One of the things about the screens is that they featured borders which will fill in the dead space on 16:9 aspect televisions. As it turns out, though, these borders reveal a bit of information when you look at them up close! Namely, it shows off quite a few, if not all of the game’s stage enemies in one of the borders (not including midbosses)." "It’s kind of hard to fix the color, since there’s clearly a blue tint on them. But it’s easy enough to make out that Tango is there. Having made a sole appearance in Mega Man V for Gameboy (and Rockman & Forte on Wonderswan, if you’re in Japan), could this cat finally be coming back?" Well, what do you make of it? Indeed, the above sprite looks similar to its MMV counterpart, but does this necessarily confirm the critter's presence in Mega Man 10? 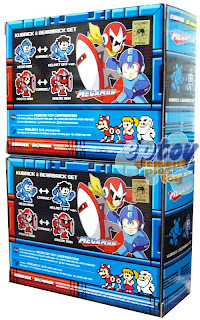 The packaging, unlike the Japanese versions, feature English names and the Mega Man logo. Capcom previously expressed an interest in selling the figures outside of Japan, and it looks like they might be fulfilling that interest. I'll keep you updated with more information as we get it. IGN.com has come through with a handful of new Mega Man 10 videos, which you can check out below. Beware, spoilers are abundant! Mega Man 10 Nintendo Wii Gameplay - The Intro. 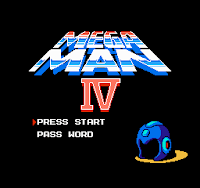 Hot on the heels of the OFLC rating, Mega Man 4 was added to the ESRB's database earlier today -- a major indication that the NES classic will hit the North American Virtual Console very, very soon. This is an action-platformer game in which players control a small figure that shoots and jumps its way through sci-fi environments. Players can use an arm cannon to shoot tiny pellets at enemy creatures (e.g., robotic hippos, caterpillars, and spaceships); effects include small white bursts and brief explosion sounds. It's likely the game will release this coming Monday, February 22, exactly one week before Mega Man 10's WiiWare debut, but I wouldn't take my word for it. Update: Well...it didn't happen. Next week's MM10, so I doubt MM4 will release on the same day. Maybe the following week! Title says it all: Medicom's anticipated Rockman Kubrick figures are planned to ship out tomorrow, the 18th! 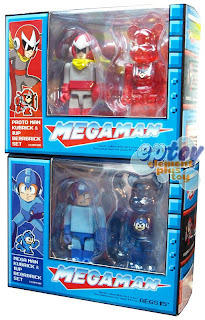 Standing at 7cm tall, the figures come with swappable parts like a helmet-less Rockman head and a Break Man helmet for Blues. 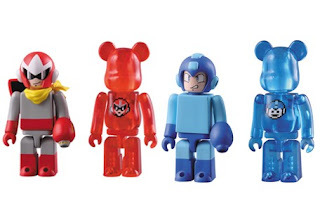 Furthermore, each figure comes with their own respective "Bearbrick", a translucent bear figure which have sprites of the character's 1-Up icons on their chests. The Kubricks cost around $40.00 USD, and can be purchased from a number of online retailers like Big Bad Toy Store, NCSX and others. Pricey, sure, but oh so awsome. Purchasing Rockman Gigamix volume 2 at select retailers in Japan yields a special bonus in the form of limited edition postcards sporting exclusive art by Hitoshi Ariga. Hopefully, the final packaging will be a bit more original, perhaps featuring brand new art courtesy of series artist Toru Nakayama. I just love Ariga's rendition of Ice Man. I think he's my favorite design next to Skull Man. Check back next week for the final Megamix profile! A new trailer for CutmanMike's multiplayer Doom mod, Mega Man 8-bit Death Match, has hit the web, which shows off some of the newer gameplay elements like additional stages and weapons. Check it out below! The full game isn't available just yet, but those interested can download a playable demo at the game's official website here. Thanks to CutmanMike himself for the pointer. Win A Free Copy Of Mega Man 10! 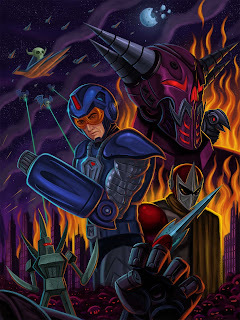 According to Amazon.com, Mega Man Megamix volume 3 is slated to ship out on August 13th -- a mere three months after the planned May 14th release of volume 2. Given the fact that Udon's recent MM books have seen their fair share of delays and bumps, this release date is most likely subject to change. And don't forget, Megamix volume 1 is just around the corner. UDON's Matt Moylan previously informed us that vol. 1 will release on February 24th wherever comics are sold -- that's only a few weeks away! Download them here! The promotion runs between today and Feb. 26th, so these won't be up forever. Thanks and Happy Valentine's Day to reader Terra for the tip. Gigazine has a obtained few snapshots of the upcoming E-Can pillow, which shows off just how big it really is. Check them out below. Capcom plans on releasing the 30x30cm pillow in March for 2,625 Yen, or roughly $28.00 USD. No word on a release outside of Japan, unfortunately. 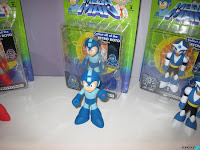 Capcom's press room updated with a ton of Mega Man 10 information tonight, which reveals not only the game's official release date, but all eight Robot Master weapons and the low down on new modes. 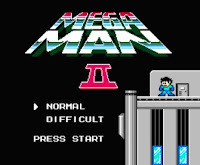 First and foremost, the much anticipated release dates: Mega Man 10 will debut on Wii's WiiWare service first on March 1st, followed by a March 11th PlayStation Network release, and a March 31st release for the Xbox Live Arcade version. 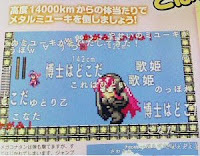 Well, here's your weird news story of the day: Lucky Star: Net Idol Meister, a PSP game based off of the popular anime/manga series, apparently features a full-fledged Mega Man parody mini-game entitled "Mega Konatan." I never quite grasped the appeal in Lucky Star, but hey, I might just have to try this! A recent survey conducted by Famitsu magazine asked its readers to rank their favorite video game characters. The results were revealed in this week's issue, and naturally, Rockman, amidst plenty of iconic heroes and villains, managed to make the cut. The blue bomber placed 22nd in the rankings, just behind Final Fantasy VII's Sephiroth and ahead of Devil May Cry's Dante. Solid Snake of Metal Gear Solid fame trumped all at number one. 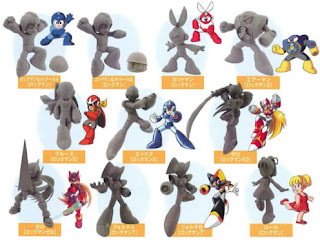 Notably, Rockman managed to outrank numerous other famed Capcom characters like Ryu (Street Fighter) and Leon S. Kennedy (Resident Evil) who placed 30th and 31st. You can check out the the full rankings and see where your favorites placed at 1UP. 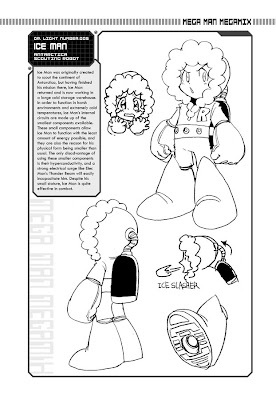 Check back each Tuesday for more Megamix profile pages! 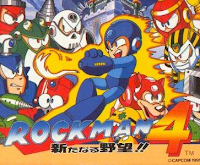 As of today, Japanese Wii owners can grab themselves a download of Rockman 4 off of the Virtual Console for a mere 500 Nintendo Points. 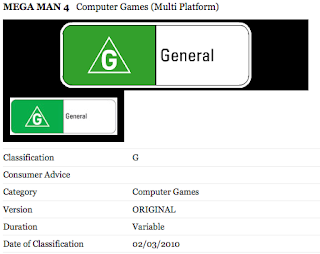 No news on Mega Man 4's release yet, but it probably isn't that far off now considering the game was recently added to the OFLC classification database; usually a good sign of progress. Thanks for the tip, Ginei! The spotter, Ivan 'Nahu' Lozano of Dark Diamond writes, "Ah the beauties of living in a country where intellectual property is so rarely enforced. I spotted this little treasure in a mall’s cell phone kiosk earlier this week, this cute little rip-off is calling himself kit-boy and would like to tell you about unlimited data cell phone plans." I love the addition of the pinstripes and the "call button" to help solidify this character's "originality." Amusing, no? Garage kit convention Wonder Festival kicked off in Japan today and as expect, there was an impressive assortment of Rockman-based models and figures. Presented after the break, a showcase of these lovely homemade creations. "Now as cool as the ScrewAttack Throwdown is, there is one last thing that I’m extremely excited to announce… you’ve heard us talk about… you’ve seen trailers for it… and soon you’ll finally be able to experience it for yourself. 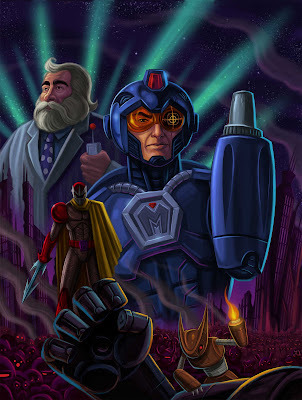 Coming in May, you will be able to find Eddie Lebron’s master piece of a fan film - Mega Man - exclusively on ScrewAttack. The Blue Bomber is going to blow you away. See the trailer here(http://screwattack.com/videos/Mega-Man-Movie-Trailer-1) Speaking as someone who has seen it, Mega Man is the way a video game film should be made. And thus: World Premiere Screening: May 1st. 2010 Online Release: May 7th, 2010." A brand new trailer for the film is said to appear sometime within the next four weeks. Another week, another Mega Man 10 fan-art contest. This week you can vote on your favorite piece of Strike Man fan-art. Take a gander at the gallery, and place your votes here! As usual, the winner of this weeks contest receives copies of both Mega Man and Mega Man X: Official Complete Works, and a position in the finals. The winner of the finals will recieve a signed skecth from either Keiji Inafune or Hitoshi Ariga. 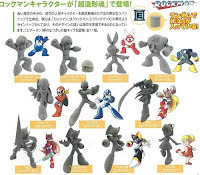 The new Bandai Rockman figures that were previously reported are now available for pre-order at National Console Support, Inc. At this time, NCSX is only taking pre-orders on the boxed set version, which comes with 11 random figures at a steep $85.90. Unfortunately, there is currently no sign of the planned cheaper, individual figures. NCSX ships to a variety of locations throughout the world, so if you're looking to import the figures, you might want to check these guys out. Inti Creates has opened up their Rockman 10 soundtrack web page, and naturally, a few additional details have popped up. Firstly, The 12 page full color booklet (above) will contain commentary from a number of Rockman 10 staff members including producer Hironobu Takeshita, and director Hayato Tsuru. The booklet will also come with some official art and guest artwork courtesy of Megamix author Hitoshi Ariga. The site also revealed a number of musicians attached to the RM10 project, each of which composed music for the franchise at one point or another. 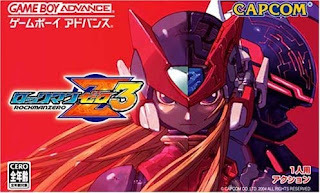 Composers include "Manami Matsumae (Rockman 1 and 2), Yasuaki Fujita (Rockman 3 and 4), Minae Fujii (Rockman 4), Mari Yamaguchi (Rockman 5), Yuuko Takehara (Rockman 6 and 7), Makoto Tomozawa (Rockman 7), Shusaku Uchiyama (Rockman 8 ) and Akari Kaida (Rockman & Forte)." 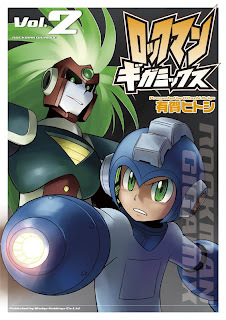 Hitoshi Ariga announced on his blog today that Rockman Gigamix volume 2 will hit retailers on February 27th for 1,200 Yen ($13.47 USD). As a followup to vol. 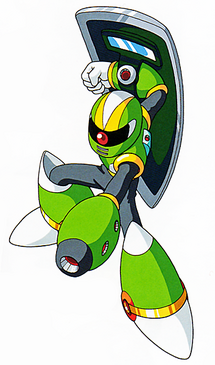 1, Gigamix 2 will depict new stories taking place within the classic series universe, and is said to feature fan-robot designs. 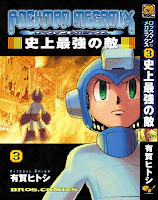 Ariga also voiced his intentions of including a couple of extra goodies like commentary and an interview with fellow author Yoshihiro Iwamoto of Rockman X manga fame. 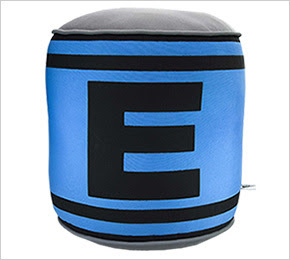 Capcom Japan plans on releasing an E-Tank themed cushion this March for 2,625 Yen, or roughly $28.00 USD. The pillow measures in at 30x30cm. Perfect cuddling size! For the time being, they can only be purchased through E-Capcom. 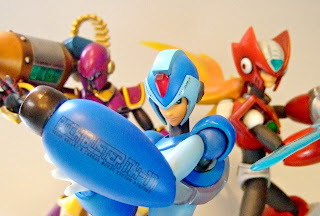 Hopefully, Capcom US will bring them our way...if not, there's always good 'ol Ebay! Australia's Classification Board, the OFLC, has recently listed a rating for Mega Man 4, suggesting that a Virtual Console release outside of Japan release isn't too far off. 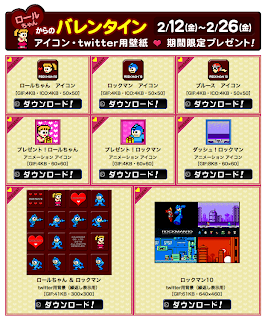 Rockman 4 is hitting the Japanese VC sometime this month February 9th for 500 Nintendo Points. Shinseido Shopping is offering pre-orders for a Rockman 10 CD soundtrack, slated to release March 23rd for 2,500 Yen ($27.00 USD). No other details are known at the moment, but I suspect we'll be learning more about it from Inti Creates soon enough. 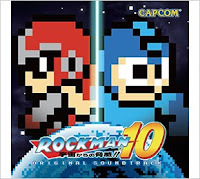 Perhaps the soundtrack's release date points to a more specific release for Rockman 10? Closer to, or on March 23rd? Furthermore, a new CD from Inti Creates entitled Inti Bonus Disc Vol. 1 was also announced. It will contain an arranged version of the "highway theme (Nitro Man stage") song, and a “non stop remix” of the boss stage themes from Rockman 9. Happinet anticipates a May release for the complete set at a cost of 8,190 Yen, or roughly $90.11 USD. Individual figures will also be sold separately, and will be much cheaper at ¥650 ($7.19 US) a pop. It's notable to mention that the boxed set may not contain each possible figure; you'll still get 11 figures, but maybe not one of every type available. "Congrats Unity members! 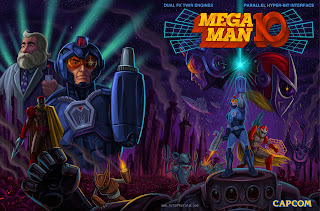 You've survived the social networking challenges and have unlocked this brand new Mega Man 10 art. What's so special about this? Well...here's a hint. There's a third. A third what? Tune in tomorrow to find out!!" What could it be? 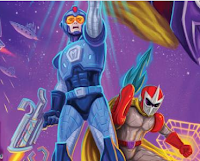 My money's on the unveiling of the third playable character, who I believe belongs to that arm towards the bottom. It's gotta be connected to somebody, right? Perhaps tomorrow will bring about a "third" picture that acts as a bookend?